August 29, 2014: Pakistan played a pioneering role in Social Franchising back in the 1990s with the application of social franchising approaches in family planning. Therefore, the First National Conference on Social Franchising, which was hosted by Marie Stopes Society in Bhurban this week, had much to reflect on with regard to leveraging past experiences to scale up this model as a way of reaching out to Pakistan’s underserved population. Our President, Sania Nishtar was invited as keynote speaker to talk about the broader health systems and reform perspective of social franchising. Aptly, she termed population explosion a human security threat. 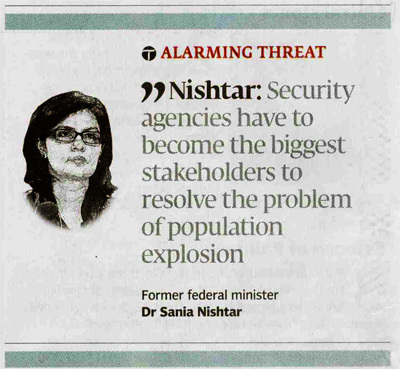 The daily Express Tribune, highlighted her quote “Security agencies have to become the biggest stakeholders to resolve the problem of population explosion [in Pakistan]”. At the meeting she mooted the idea of a Declaration, which got shaped as the Bhurban Declaration. 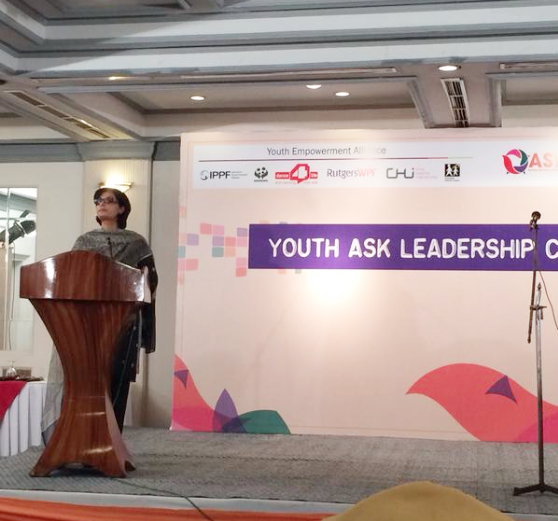 August 13, 2014: ‘The Youth Ask Leadership Conclave 2014,’ concluded on Sunday, August 10, 2014 in Islamabad. The conclave was organized by Rutgers WPF, Pakistan, under the programme ‘Access, Services and Knowledge,’ funded by the Dutch Ministry of Foreign Affairs. Its purpose was to provide young people with a common platform through which they can acquire knowledge for community leadership. The event led to a Charter of Demand, which was shared with the media. 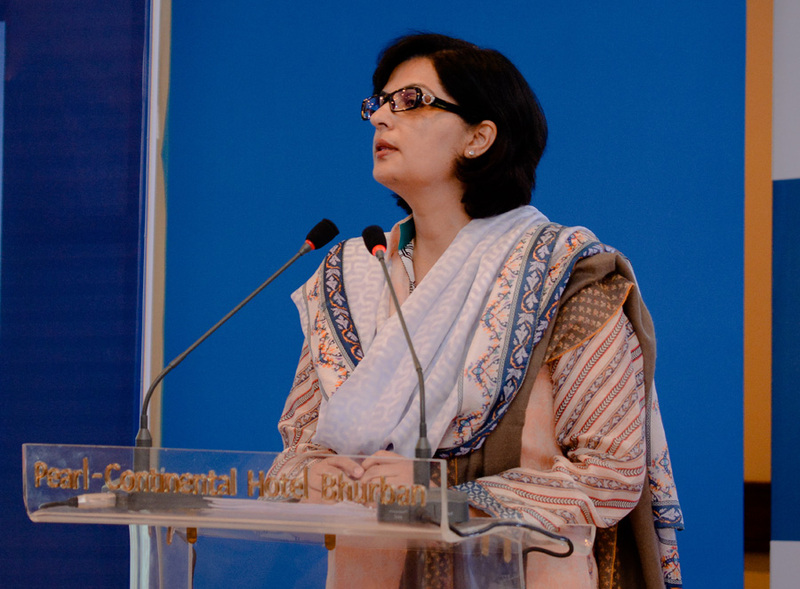 Out president, Dr. Sania Nishtar gave the keynote speech at the opening of the event. More information about the event can be accessed here. August 12, 2014: “Sometimes, the rationale of a policy decision becomes apparent long after the actual decision itself. The imperatives created by the polio travel conditionality will help us understand why it was critical to reestablish Pakistan’s Ministry of Health”. This was the opening statement of an Op-ed, which recently appeared in the News International. The author, our President Sania Nishtar explains, using the Polio travel conditionally as an example, why she established Pakistan’s Ministry of Health during her tenure as Federal Minister in 2013. More details about the establishment of the ministry can be accessed on Page 49 in her enclosed Handover Papers. Privatisation is subject to intensely polarised political discussions, which cloud important policy imperatives that need to be appreciated. Six points are being outlined in this respect. First, we must get the framing on privatisation right. Privatisation must not be viewed through the narrow lens of sale of state enterprise to bridge fiscal deficit. Privatisation is deeply linked to the fundamental question of the role of the state in the economy and is part of a broader economic liberalisation and deregulation agenda. It is one of the policy choices a government can espouse to make the private sector the engine of growth with the understanding that the role of the government is to provide an enabling policy, impartial oversight, and a level playing field for market entities. When a country such as Pakistan embarks on the broader deregulation path, it has to be prepared to overhaul its own institutional competencies within government. This is a long-term agenda. Far from political polarisation, political consensus is needed to go this route so that the course can be insulated from policy vacillation. Second, there must be clarity about what a government can and cannot privatise. Policymaking and regulation are core government functions from which it cannot divest responsibility. Running enterprise, on the other hand is not a core government role, unless there are exceptional circumstances, such as lack of incentive for the market to operate in an area or the pursuit of a strategic objective. Other than these exceptions, enterprise should be left to the market. Pakistan has a long list of inefficient and parasitic Public Sector Enterprises that do not fall under these list of exceptions. The government therefore has two options to deal with them – either to reform governance while continuing to have state control or privatise them. Since there is no one-size-fits-all formula, decisions must be prudent and evidence-guided. Third, a parliamentary approval should be considered for the list of entities to be privatised. The 2000 Privatization Commission Ordinance is being interpreted as a framework privatisation act. However, lessons from other countries show that legislative authorisation is usually needed to change the status of individual PSEs as well. A legislative cover can have beneficial impact with reference to transparency and policy support for privatisation, overtime. The fourth point relates to the institutional prerequisites for privatisation. Since engagement with the private sector demands certain institutional capabilities within the government system, the government should privatise a PSE only after an appropriate regulatory framework for the privatized entity/mandate has been created. Given Pakistan’s past performance with regulatory arrangements, a massive effort needs to be put in place to step up government regulatory capacity and develop it for sectors and mandates that are to be privatised. Also, in terms of institutional arrangements, when a government retains an influence in the PSE following privatisation or management divestment, it is critical that it creates the right accountability of state functionaries who represent the government’s interest on the board. Procedures should be in place to safeguard impartiality, especially in the face of board remuneration several times higher than monthly salaries. The fifth point focuses on the process safeguards that are necessary for the privatisation process. As privatisation is a complex procedure and not an ordinary auction a robust and transparent process becomes critical for its success. The opponents of privatisation are often not ideologically opposed to the idea but fear that the transactions may be carried out in a non-transparent and/or unfair manner, state assets could be sold at throwaway prices, political cronies could be rewarded for allegiances, that in the process of ‘stabilising’ these enterprises state resources may be unnecessarily spent and that strategic objectives could be compromised. Lessons from past privatisations should be brought to bear, especially where there was evidence of monopolistic trends, collusion in valuation of assets or doubt about the motivation of buyers. Privatisation vests enormous power of patronage in governments and these concerns are a real risk. Through appropriate due diligence and conflict-of-interest management in appointment of board members of the Planning Commission and the agencies to be privatised as well as evaluators and external advisors, the government can hedge against this risk. Also, in relation to the process, due attention to job security, wages and benefits of incumbent staff become important, with the general rule being that their contractual rights should continue to be honoured after transfer of ownership. The Pakistani post-privatisation experience has been plagued by inconclusive resolution of labour issues, with the case of the PTCL pensioners being illustrative. Lessons can be drawn from that experience. Finally, the greatest risk for the privatisation process is the lack of accountability within the state system, as a result of which public sector functionaries cannot be held accountable for their inability to safeguard state and/or public interest in privatisation deals. The current state of existing PSEs is reflective of a style of governance to which all past government regimes have contributed. Years of poor governance, evidenced in crony appointments, recruitments without regard to competency or organisational needs, procurement collusion and lack of accountability of decision-making have landed these organisations in the current state of affairs. Privatisation must not be pursued under the same shadow of governance. Privatisation is indeed an option for some of the entities listed in the privatisation list. It can accrue benefits to consumers, workers, investors as well as government. We need fundamental reform of governance, one that puts decision-makers’ accountability at the core of the state system before expecting to reap privatisation’s benefits towards the goal of economic reform.